This error only appears on Windows 7 machine that has a product from Symantec installed on the machine. So far we have only found Symantec Endpoint Protection (SEP) that causes this problem. There could be other products that use the same DLL. When you run any application on this machine, SEP loads its own DLL in the same memory space as WinSQL. The actual error occurs in SYSFER.DLL, not WinSQL. This DLL should be located in your %WINDIR%\System32\ folder. SEP loads its own DLLs with every application that you run on your machine. Our analysis shows that SEP tries to register several hooks in the OS and generates this error during the process. 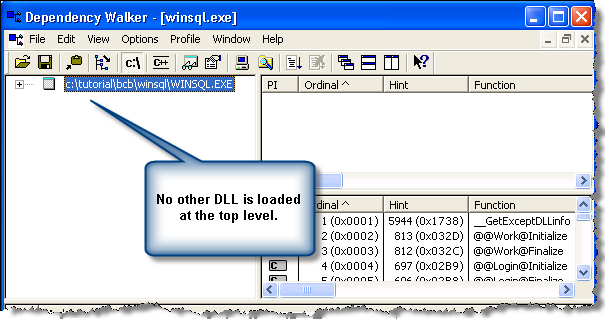 Since the DLL is loaded in the same memory space of the actual application (WinSQL in this case), it appears that WinSQL is generating the error. 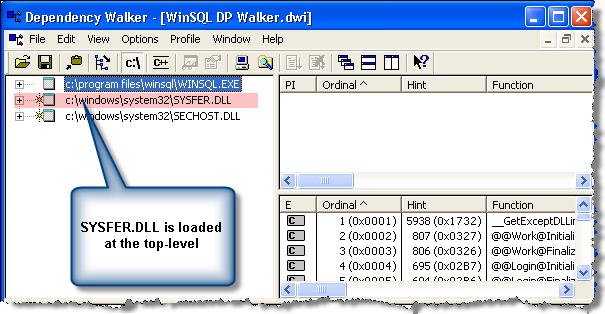 We used a third party application called Dependency Walker (http://www.dependencywalker.com/) that shows a list of DLLs that are loaded by an application. The following images show screen shots taken from two machines. One with SEP installed and the other without it. This problem occurs with any application that is written in Borland C++ Builder 2006. We have created a very small application that displays just one small windows on the screen. You can use this application to recreate this problem on your end. Click here to download this application with source code. Unfortunately, since the root cause of the problem is not in WinSQL, we cannot suggest anything but ask you to contact Symantec's support department. You can also ask them to download the test application mentioned above so that they can reproduce the problem on their end. hello I have in the problem of "the application was unable to start corretly (0x00000a5)" so please give me advise to fix the problem. please check to google chrome help for "the application was unable to start corretly (0x00000a5)"